Looking for a fun thing to do while on St. John or when you have guests in town? How about a nightpaddle? We have some amazing paddles with integrated LED lights that will light up the underwater world for about 10ft around you. Their strong LEDs create 720 Lumens. Lights shine on just one side of the blade; lighting up everything you want to see in front of you, without blinding you or those behind you. We usually see barracuda, tarpon and stingrays during the nightpaddle as well as the little blue fish and sometimes also little nurse sharks. 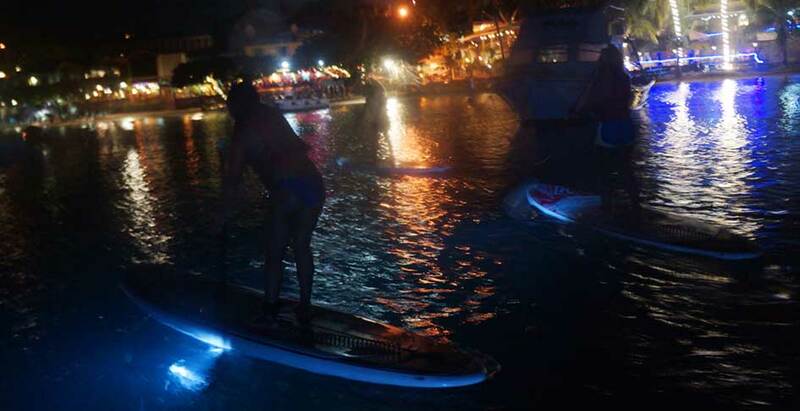 You can add the LED Paddles to your normal paddleboard rental or you can just try it out for one evening we will meet you at the beach with the boards and paddles, during summer months we will meet you at 6:45pm during winter earlier. You can choose if you want Lucy to paddle with you or head out on your own. It is usually super calm at night, so it won’t be difficult, no prior Paddleboarding experience is required. You should however be a good swimmer and be able to get up from your knees to a standing position by first going on your hands and knees and then standing up.